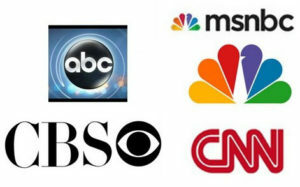 If the U.S. is split about 50-50 between liberals and conservatives, why are the overwhelming majority of major TV news outlets liberal? Conservative radio host Rush Limbaugh said the money to take on ABC, CBS, NBC, etc. may be out there, but getting wealthy conservatives to take the risk is another story. “Of the wealthy people that I’ve met who have the money to do this, they think it’s a losing proposition business-wise. And they don’t care,” Limbaugh said on his April 9 radio broadcast.